Popular Middle Eastern deep-fried sweet delight. Blend together oil, ¼ cup castor sugar and yogurt till well combined. Add egg and vanilla essence and blend till the egg is well incorporated. Transfer into a bowl. Sift together flour and baking powder into the egg mixture and mix lightly. Cover with a cling film and set aside for 1 hour. 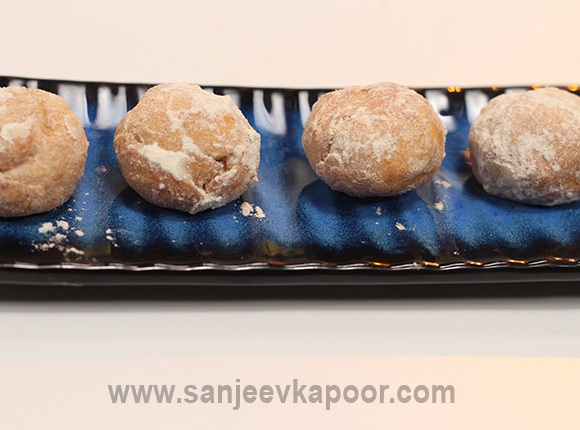 Grind the walnuts with 2 tablespoons castor sugar, cardamom powder and cinnamon powder to a coarse powder. Divide the flour mixture into 12 small portions and roll into thick circles. Stuff each with a portion of walnut mixture, bring the edges together and seal. Roll into a ball. Heat sufficient oil in a kadai. Deep-fry the balls till golden brown and crisp. Dust icing sugar on top and serve immediately.